Submitted by Huahai on Wednesday, December 28, 2011 - 07:02. I was brought up as a Han Chinese and I myself have never doubted that identity. However, I do know that I look slightly different from people around me when I grew up. Darker skin, slightly curly hairs, deeper set eyes and other distinctive facial features. Put it simply, my face does not look like an average Han male face. However, nobody really said anything about my appearance except that my old brother occasionally joked about it (he looks like a normal Han Chinese by the way). After all, I look just like my father. Besides, there are plenty of male relatives in my father's native village (near Chongqing) who look just like me. It took a foreigner to first question my ethnicity. When I was in graduate school in Beijing, there was an exchange student in my group, an African American girl, who one day took me by surprise by asking: "Are you Han?" I instinctively answered "Yes". She didn't say anything more and I didn't either, but I knew why she asked. When I came to US, the situation got worse. When I went with Yunyao to visit her college friends, they always talked English with me first, then were totally startled by my almost perfect Mandarin. Hispanic people in the states always wanted to talk Spanish with me then were surprised by my inability to speak their language. Later I learned one Spanish phrase or two. When we traveled in Latin American, people in the restaurants always insisted on correcting my poor Spanish pronunciation while ignoring Yunyao's arguably worse performance. Since all the female members of my family look like normal Han people, Yunyao became curious about my paternal ancestry and suggested me to take a DNA test to find out. At first, I dismissed this seemly outrageous idea. A few months ago, I became curious myself when I learned a few things about the make-up of Han Chinese Y-DNA haplotypes. Below is a chart I made using the data from this Nature study on 1289 Han males in year 2004. O3*, O3d and O3e all belong to the group O3. 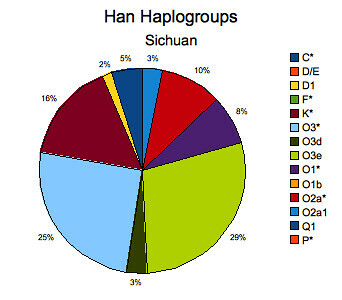 It is interesting to see that O3 takes up about 55 percentage of the Han populations. 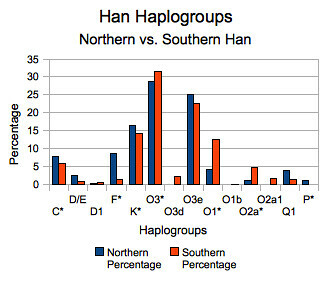 Clearly, Northern and Southern Han Chinese males have similar genetic distributions, so the alleaged north-south difference is not that significant, at least in term of male lineage. 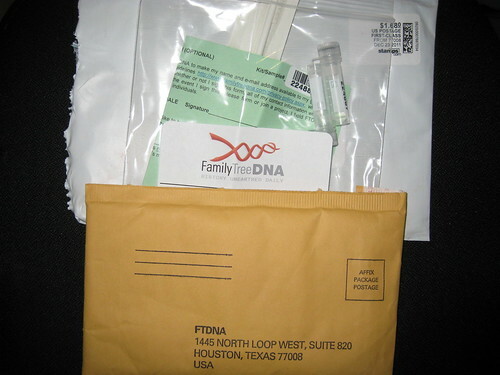 There are two swabs and two specimen tubes in the package. Following the instructions, I scraped my cheek for a full minute, put the swab in the tube, and put everything into the envelop provided, and mailed the package back. The number of Sichuan Han people tested in the Nature 2004 study is only 65, so this chart may not be very accurate. In the absence of better prior information, let's work with this. There are 5 percent of C*among Sichuan Han people. A major part of these are likily the decendents of the Mongol invaders. Since I am not Mongol looking, I rate the probability of my being C* to be zero, P(C*)=0. The two percent of D1 in Sichuan Han people are likely related to a Tibetan origin. According to my family history, this is again unlikely my paternal lineage, P(D1)=0. There are surprising large percentage of K* shown in the data. K is a very old lineage appearing around the Pacific everywhere, and is particularly common in the Australian islands. I think the chance of my being in this group is higher than normal. Of course, it could be that the study didn't not differentiate some of the down-stream haplogroups of K, such as LT, M, N and S. In any case, I rate the probability of my being one of these K people higher than 16 percent, P(K*, LT, M, N, or S)=0.2. Similar to the national level, O3 is the most common among Sichuan Han people, taking up 57 percent. Since I am not normal Han looking, I will down rate the probability of my being O3 from 0.57 to 0.3, P(O3)=0.3. I cannot down rate O3 too much though, as my blood brothers do look like normal Han. The eight percent of O1 in Sichuan Han people are likely the results of migration from other parts of southern China, as this is a common gene type in southeastern Asia. Given our family history, the probability of my being O1 should be significantly higher, P(O1)=0.3. O2 accounts for 13 percent of Sichuan Han people. O2a is commonly seen in the tribal people of southern Asia. I rate the probability of my being O2 higher than normal: P(O2)=0.2. Hello, I'm curious about your results. Did you find out anything interesting? I too have always thought of myself as Han Chinese, but receive comments about not looking like the "typical" Chinese. Some people have asked if I'm "pure" Chinese. I also have deeper set eyes and other less common features. Thanks! Thank you for stopping by and finding this post interesting. I guess FamilyTreeDNA got a lot of orders over the holidays so they are slightly behind in testing all the DNAs. I ordered a 37 markers Y-DNA test. So far, the results of my first 12 markers are in. My predicted haplogroup falls into the group of O-M175. This means that I have a typical Eastern Asian paternal ancestry. I guess DNA is more than skin deep and we shouldn't take facial appearance too seriously. I don't know if I am O1, O2 or O3. When all my results are in, I will write a full blog post. Did your results come out? The first round of results are not very discriminative, just said I was O, with 70% chance to be O3. So I did pay more money to do the so called Deep Clade test, and found that I am indeed O3. In fact, I am O3a. My DNA matches only the marker of the root of the O3a tree (M324), but matches none of its common subtrees. 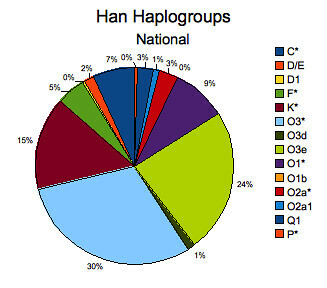 So I am both a typical and atypical Han, typical becuase I am O3, atypical because I don't belong to any of the commonly seen subgroups of O3.